Chunk candle making is a wonderful, easy variation to try in your homemade candles. Chunk candles are formed from chunks of colored wax with clear wax poured over them, making a stained glass effect. Chunks can be solid or translucent, one color or multi-colored. You can also make your own wax chunks, which will allow you to make them exactly the color and fragrance that you like. A great way to make wax chunks is to use leftover wax from another project. Melt your wax, colored and scented as desired. Prepare a sheet pan (one with sides) by lining it with aluminum foil. Make the foil into a kind of pan with sides as well, so the wax won't pour out all over your pan. If you want thick chunks, shape your foil so that the container is taller than it is wide. Or just make your foil pan about the same size as your sheet pan. Wax chunks do not have to be incredibly thick to make a lovely candle. Pour the hot wax into your foil pan and allow to cool completely. Remove the hardened wax from the pan and use a craft knife to cut the wax into chunks or slices. They can be even or haphazard. Choose a candle mold of whatever size and shape you like. Chunk candles look best when they are round, square, or some other simple shape. Prepare your mold however you normally do and thread the appropriate wick through your mold, sealing it with mold sealer. Place the chunks of wax around the outside of the mold, stacking them on top of each other as needed to make them as tall in the mold as you want the candle to be. When placing your wax chunks, you want them to be mostly visible around the outside of the candle. You'll want to put them close to the edges of the mold, but you don't want them all to be lined up perfectly or such that they cover the whole outside of the candle. Once you've set the candle up, melt plain clear wax. Pour it over the chunks and allow to harden. Top it off and allow to cool again before removing from the mold. The edges of the wax chunks (especially those you make yourself) will probably melt a little. When you burn the candle, the light will glow through the clear wax and look sort of like stained glass. 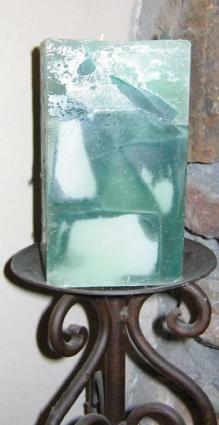 Use a translucent scented candle chunk like a honeydew melon chunk for a great bathroom candle. Use a collection of chunks in primary colors to make a cool candle for a kids room (but don't let them burn it unattended). Pick a shaped chunk (peaches, strawberries, or whatever your favorite fruit is) and make a short candle or a series of matching candles to use on your dining room table. Make a candle out of a Mason jar, stuffing it full of chunks shaped like your favorite fruit. This cute "preserve candle" makes a great gift (cover it with a piece of gingham trimmed with pinking shears and secure with the screw-top ring used for canning). Combine several kinds of fruit-shaped chunks for a "fruit salad" candle. You could also layer fruits to make a sort of trifle look.